BigLift Shipping was assigned by Heerema Offshore Services B.V. to transport several crane parts for the new SSCV Sleipnir from the Huisman fabrication yard in Xiamen, China. Sleipnir is being built and assembled at the Sembcorp Marine Shipyard in Singapore. In two voyages BigLift Baffin transported two luffing frames (measuring 35*33*36 metres and weighing 1,170 mt) two crane booms (measuring 146*28*19 metres and weighing 1,465 mt) and several crane blocks, with weights varying from 70 to 245 mt – in two voyages. 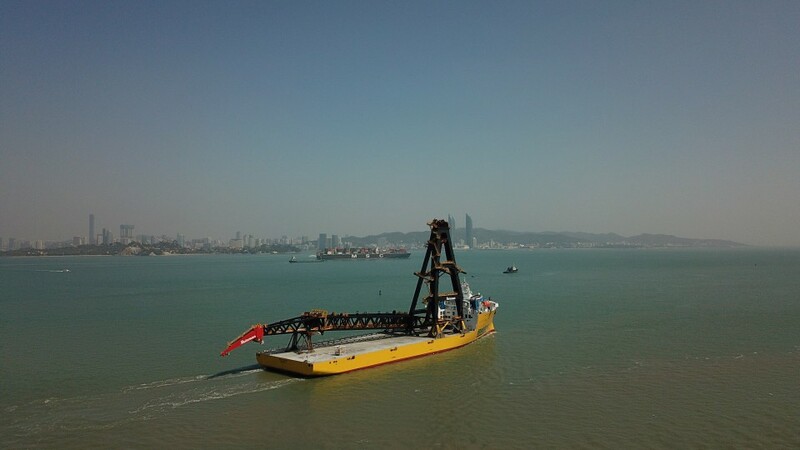 All the crane parts were loaded and discharged with the Lift-on/Lift-off (LoLo) method with the aid of Huisman Fabrication Yard’s Sky Hook in Xiamen and a crane barge in Singapore.